1,000 hour full Engine and generator service was done: new raw water pumps, belts, hoses, clean coolers, heat exchangers, Oil cooler, valve adjustment, oil and fuel filters, serviced all hoses, pumps, risers and belts, steering system. New cushions, New Carpet, New BBQ Grill, New Flybridge bimini top, New canvas cover for flybridge area. Retreated interior wood floors, Treated teak deck. New batteries AGM, Adjustment of Fuel gauges and sender. New bottom paint and Propspeed paint. Adjustment of Prop and running gear. Replaced lower station engine displays. The "Minnie Bell" is a large 51' spacious motor yacht that sleeps 6 people in its 3 staterooms, 2 head layout. The forward master stateroom has a queen size bed and an en-suite head with a separate shower area. Aft to port is the VIP stateroom with a entertainment, with a large spacious flybridge, full teak deck cockpit, galley, dining salon, lower helm station, and a large main salon. She is powered by reliable twin QSM Cummins Engine (635hp each) with low hours...only 1,600 hours. Schedule your showing today! United Yacht Sales New Jersey would love to guide you through a personal showing of this 51' Sealine T51 1999. 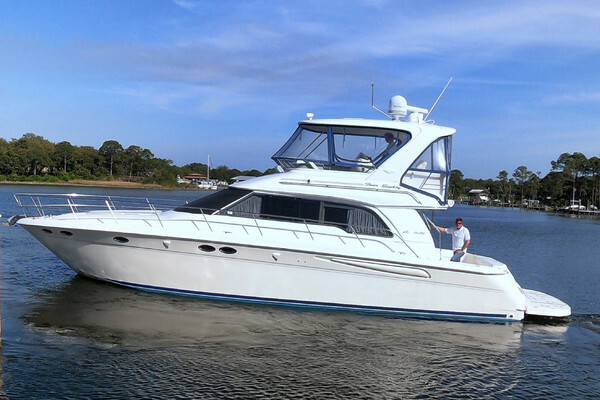 This yacht for sale is located in Delray Beach, Florida and priced at $189,000. For a showing please contact us by filling out the form on this page and we will get back to you shortly!